After the snow and rain begin to dispel and the sun begins to shine, there is no better feeling than being outside breathing the cool spring air. This is the perfect time to gather your friends together for some yummy food while catching up. Decide on a theme and scour your local stores and online for the best deals for decorating. The theme I decided to go with was a quirky mismatch fit for the Queen of Quirk herself, Zooey Deschanel. Often when shopping I would ask myself, what would Zooey do, WWZD? Well, Zooey would definitely take animal figurines, paint them gold, and scatter them about for funny conversation starters. She would also want to make her guests feel extremely comfortable and create little seating areas for them to relax. But most importantly, she would have a variety of cute little snack foods to appease all her friends and guests. Mixing and matching prints and colors is a fine art. The best way to make it cohesive while avoiding “matchy matchy” is to find a common color within your patterns. I chose yellow as my common thread between many of the pieces, mainly the tablecloths on all the tables. Easy ways to mix patterns and colors together are in your place settings. Rummage through your cupboards to see what you already have that could get a fresh take with new textiles such as; tablecloths, placemats, napkins, and napkin rings. See below how I made different place settings using an array of layered pieces. If your home or yard isn’t quite ready for guests, search for local spots like city parks or community areas. 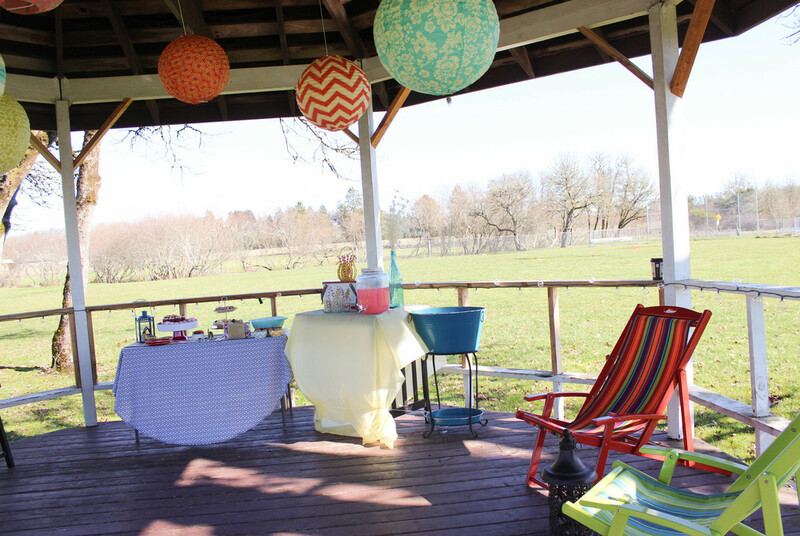 I found this adorable gazebo at Philomath City Park that was perfect for my soiree. Most likely the amenities will be free to use and sometimes you are able to reserve the spots to ensure that your party won’t be crashed by someone else.